Whether you’re a car enthusiast or you just need something to throw in the trunk for emergencies, one of these car jacks should have you covered. Unless you’re a car fanatic or a mechanic, you probably haven’t given a lot of thought to your car jack. But if you ever find yourself stuck on the side of the road with a blown tire and a three-hour wait for roadside assistance, you might wish you had. Having a good jack and jack stands is important, even if you only use it in emergencies. We’ll tell you how to determine what kind of jack is best for you and give a few recommendations. 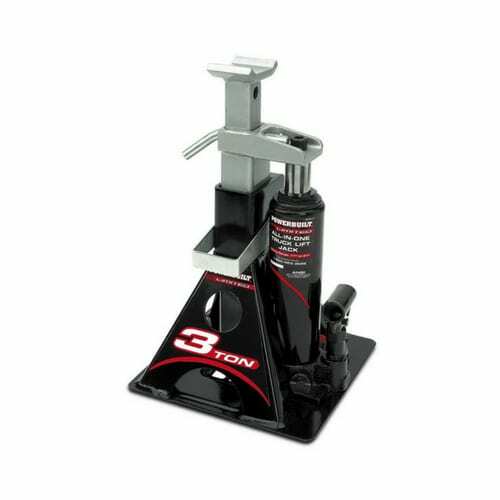 The Torin T10152 is one of the most popular and highest-rated vehicle jacks on Amazon. This scissor jack is cheap enough for anyone to pick up for those rainy-day emergencies, but built well enough to last. It has a respectable capacity of 1.5 tons and a maximum 15.4-inch lift. Despite that, it shrinks to just 3.7 inches when collapsed, which is less than most competitors. Pros: The Torin is very affordable, but the quality is much better than you’d expect at the price point. Its large base gives you plenty of stability on less-than-ideal surfaces (like the shoulder of an interstate). The jack also has a hefty 1.5-ton weight capacity and wide lift range. Cons: That same large base that provides great stability can also make it tougher to store in small trunks. Some customers reported the screw mechanism didn’t always operate smoothly, especially when lowering the vehicle. 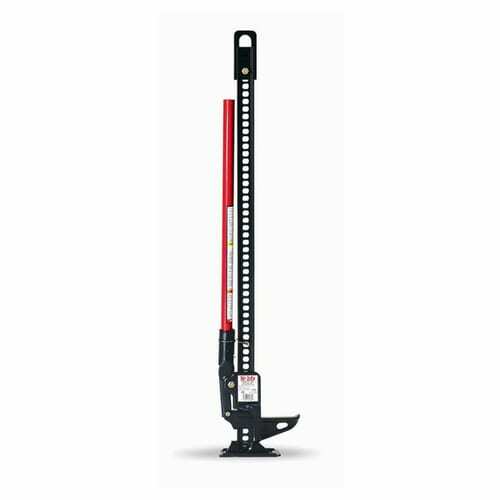 While a compact scissor jack is great for cars and convenient to tote around, something a little beefier, like a hydraulic floor jack, might be necessary if your vehicle is on the larger side. This bottle jack, has a huge three-ton capacity and a height range of eleven to twenty-one inches, making it perfect for trucks, SUVs, and other large, heavy-duty vehicles. Pros: The high weight capacity and maximum height of this hydraulic floor jack make the Powerbuilt the ideal jack for large vehicles. It has a large, stable base, is affordably priced, and delivers a lot of power. Cons: Quality control seems to be a bit hit-or-miss: some reviewers had to exchange their jacks. The size is on the large side compared to a scissor jack. The Black Bull is an electric scissor jack that you plug into the cigarette lighter in your car and operate with a remote control. It doesn’t get any easier than that. It has a one-ton capacity and a max height of fourteen inches. Pros: The Black Bull’s fully automatic operation means no manual cranking. This jack is great for teens, people with mobility issues, or anyone who might have trouble with a manual jack. Cons: This jack is expensive for a scissor jack. Because it’s electric, its lift range and capacity are on the lower end. This jack may not be suitable for trucks and SUVs. For the true off-roaders out there, the Hi-Lift Jack delivers serious power. This is a unique type of jack intended for vehicles with high clearance, like off-road vehicles and farm equipment. This bad boy has a hefty 7,000-pound weight capacity and a forty-eight-inch lift height. Although not exactly compact, this jack is narrow and perfect to throw in the bed of a truck. Several accessories are available, including an off-road base to help with stability on difficult terrain. Pros: Ruggedly built, the Hi-Lift Jack has an awesome lift height and weight capacity. Users love its reliability. Cons: Because it’s for heavy-duty needs, this jack is not compact. It’s very tall at forty-eight inches and heavy at twenty-eight pounds. 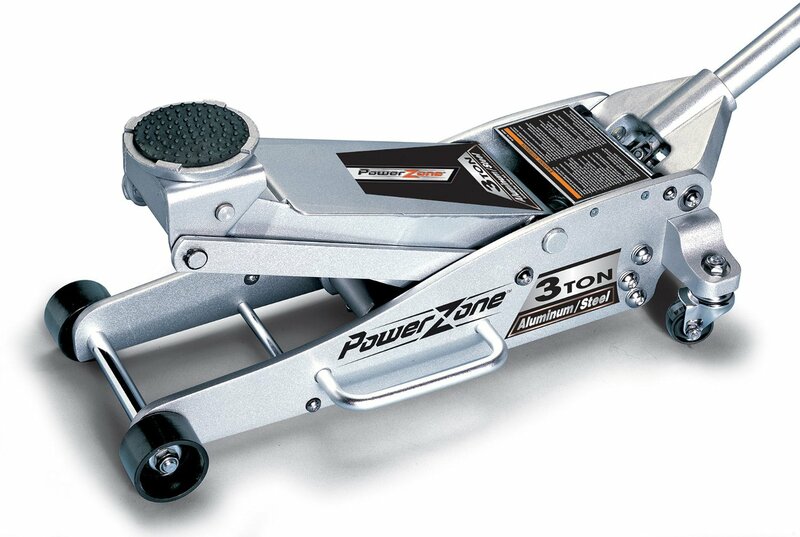 If the Powerzone jack is a little expensive for you but you still want the convenience and capability of a floor jack, the Pro-Lift Floor Jack might be right up your alley. This jack has a lift range of 3.5 to fourteen inches and a weight capacity of two tons. 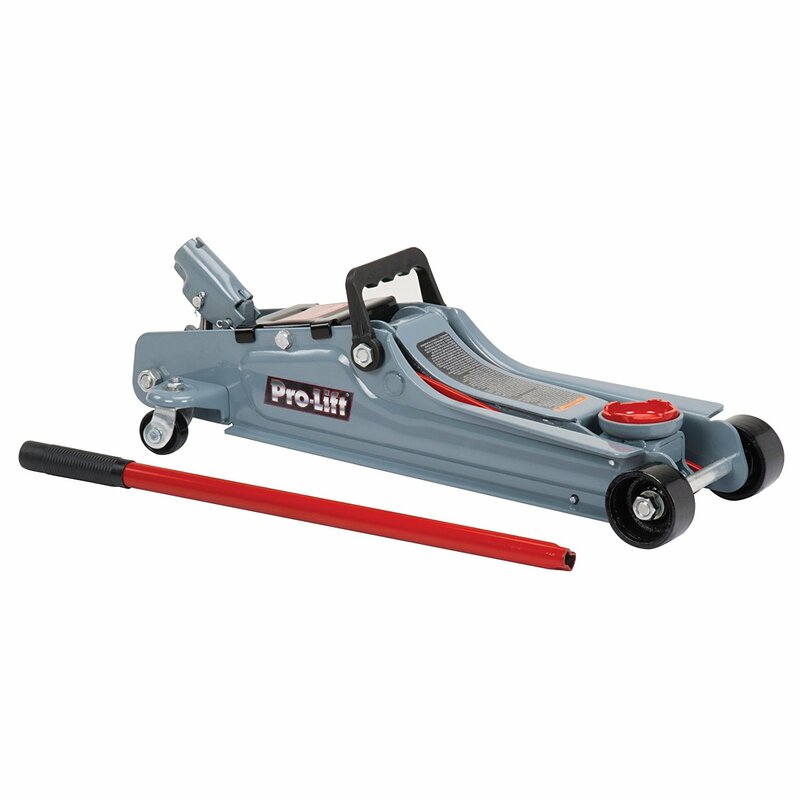 Pros: The Pro-Lift is very affordable for a floor jack. Its low profile makes it perfect for low-clearance vehicles. Cons: This jack lacks the weight capacity and lift height of other floor jack options. First, you need to choose the right type of car jack. Here’s a rundown of the most common types. 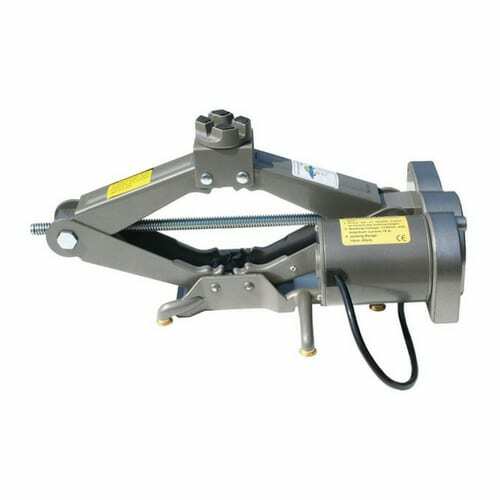 Scissor jacks: This is the most common type of jack that will work with just about any car. They’re simple to lift and often come stashed in the spare tire compartment of new cars. Scissor jacks operate by turning a large screw, which causes the two sides to “scissor” together and raise the vehicle. They’re usually lightweight and compact, so they make great additions to emergency kits. Bottle jacks: In terms of portability, bottle jacks are a step up from scissor jacks. The name comes from the shape of the hydraulic jack: it looks like a bottle. These jacks use a hydraulic mechanism to provide a lot of lift. They can still be small enough to fit in your trunk, and are ideal if you have a larger vehicle like a truck or SUV. 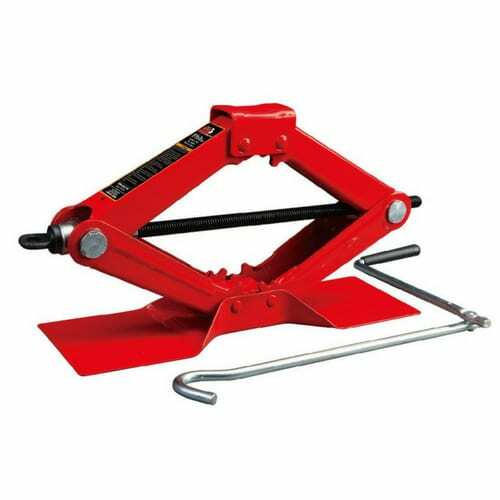 Floor jacks: These hydraulic jacks are often used in garages with jack stands. They have wheels for easy movement, since they tend to be pretty heavy and unwieldy. These jacks are workhorses, known for their durability and reliability. They also tend to be much more expensive than scissor or bottle jacks. You likely won’t need a floor jack unless you perform maintenance often. Regardless of which type of jack you choose, you want something well-made and durable. You don’t want the thing failing and dropping your car (yes, this can happen). For scissor jacks, check the screw mechanism and make sure it operates smoothly. If space is a concern, check the dimensions of the jack and make sure it will fit wherever you plan to store it. Most importantly, you want to make sure the jack can lift your vehicle. Most jacks will work fine with most vehicles, but if your car sits particularly low or high (think Corvette) or is very large (like bigger SUVs, trucks, and vans) you need to pay attention to the lift range or weight capacity of the jack and do some measuring. Make sure the car jack is rated for at least 75% of the vehicle’s weight. These figures are usually well-advertised when you’re shopping for jacks, so it should be easy to get the information you need.